Moe! 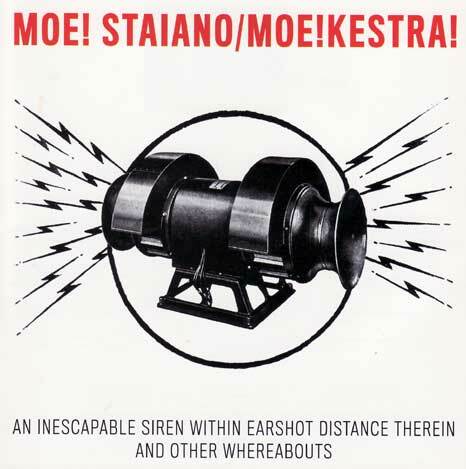 Staiano and Moe!kestra! doing two large-scale orchestral works. This is Moe! Staiano’s first CD of orchestral compositions, which differ greatly from his conducted improvisations. The release includes Piece No. 5 for Orchestra, and Piece No. 7: An Inescapable Siren Within Earshort Distance Therein and Other Whereabouts (for Strings, Percussion, U-bolts, Wine Glasses, Prepared Guitar and Sirens). The pieces were recorded in 1998 and 2003, respectively. Moe! Staiano is a self-trained composer/performer who uses large ensembles of mixed instruments as a canvas for sonic exploration. His scores combine text, graphics, and conventional notation, and he is equally inspired by the composers Glenn Branca, Krystof Penderecki, and John Zorn, as well as the bands Einsturzende Neubauten, the Ex, and the Ruins.